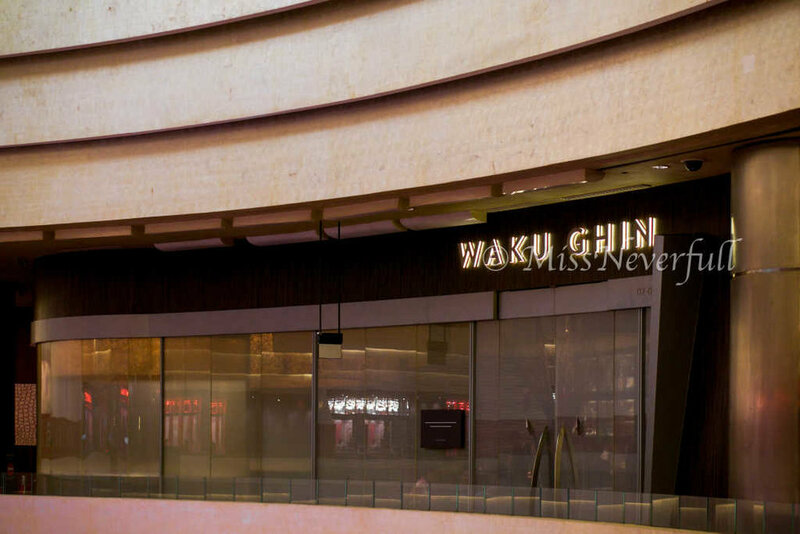 Waku Ghin, one of the most famous restaurants in Singapore, ranked No.9 Asia's Best Restaurants 2015 and one of the only two Singapore restaurants have made it to a list that ranks the top 100 restaurants in the world. Taking its name from two Japanese words – 'Waku' meaning to arise, and 'Ghin' meaning silver, in honour of Tetsuya Wakuda’s signature colour, who is the first person appointed Sake Ambassador outside of Japan, making his selection the best in the world. He also recently won the prestigious Diners Club® Lifetime Achievement Award - Asia 2015. The dining concept at Waku Ghin is quite different from Tetsuya's in Sydney although both serves Modern Japanese cuisine, Waku Ghin's was split into four private rooms of differing styles, varying from a muted grey-and-white-walled room with carpets to a warmer, wooden-floored bar-style seating area.Each private room is helmed by a chef, bringing the best seasonal produce to the Chef’s Table, after the Chef's show, you will be leading to the main dining room for desserts and coffee with stunning views of the Singapore skyline. Our chef, Cory Soo Thoo firstly presented the day's seafood selection that will be served later on, which includes Canadian lobster, Hokkaido sea urchin, Tasmania abalone, etc. 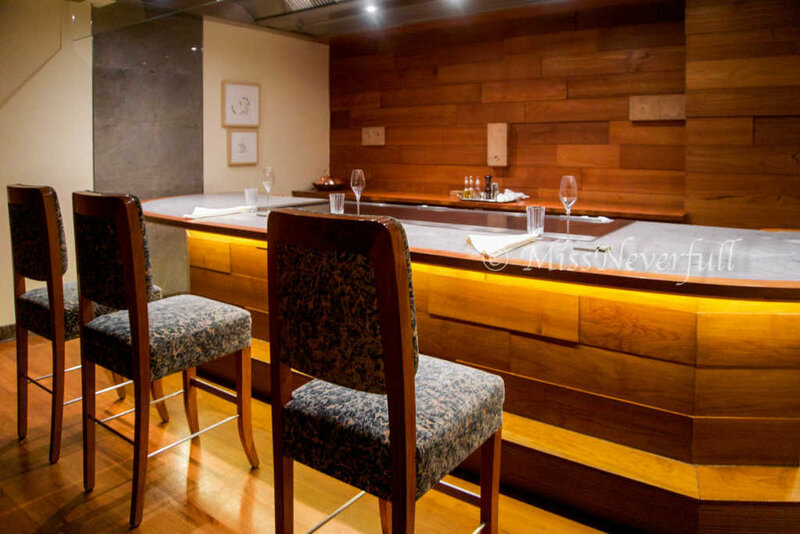 Some of the dishes will be prepared by the kitchen, the rest will be cooked in front of us at the Chef's table. Special sake for Waku Ghin only. It has a very clean and fruity taste - perfect with the appetizers. The first dish was two sliced of Tonbo tuna, which was a premium fatty white tuna belly, on a bed of seaweed and topped with fresh wasabi. The tuna was rich in oils and perfectly melted on my tongue like butter, with a deep and clean flavor. Haven't had such beautiful tuna for a while. Second dish is the signature at Waku Ghin, which is also the dish i came for. The texture of botan shrimp was incredibly rich, the sea urchin was very creamy - both very umami and have an endless sweet aftertaste. The gorgeous portion of caviar on the top brought more texture and flavors to the entire dish. It was so good but i found this dish requires very little culinary skills - the impressive flavors were all from the ingredients themselves. After the two cold appetizers, Chef Cory again came back to the table, brought trays of condiments and cooking utensils and settled behind the counter. He showed us the fresh Canadian lobster which will be soon braised in front of us. After added in the sauces and seasonings, the lobster was placed on the side and cooking in a low temperature. We were then served with another hot dish prepared by the main kitchen on the back - Pan-Fried Kinmedai with Squid and Bouillabaisse. I was so impressive with its perfectly seared skin - it was so thin and flawlessly crispy, just like a candied or caramelized layer used in desserts. The white flesh underneath was moist and high in flavor, while the squid on the side was a bit chewy and more on the tender side. The creamy bouillabaisse was also very enjoyable. Chef Cory then presented the Alaskan King Crab's legs. He made a sea salt base on the iron griddle, added some water on it and placed the crab on the salt for steaming - as the sea salt bake with a steam bath can brings their best flavors. After 2-3 minutes steaming, Chef Cory took out the cooked king crab, finishing with some lemon scented extra olive oil and ready to serve. 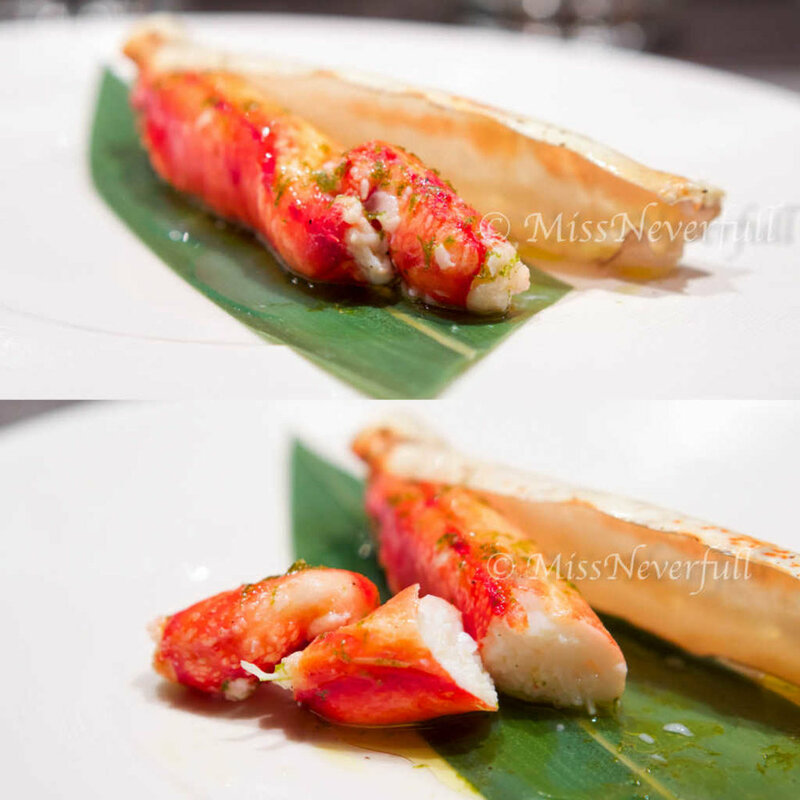 The king crab was simply pretty - juicy, tender, umami and has a lovely sweetness from itself. The lemon scented extra virgin olive oil brought a touch of refreshing and nicely enhanced the flavor. This is another signature dish at Waku Ghin, served with a very lovely grilled aroma. The abalone itself was very succulent and tender, with a slight chewy texture. 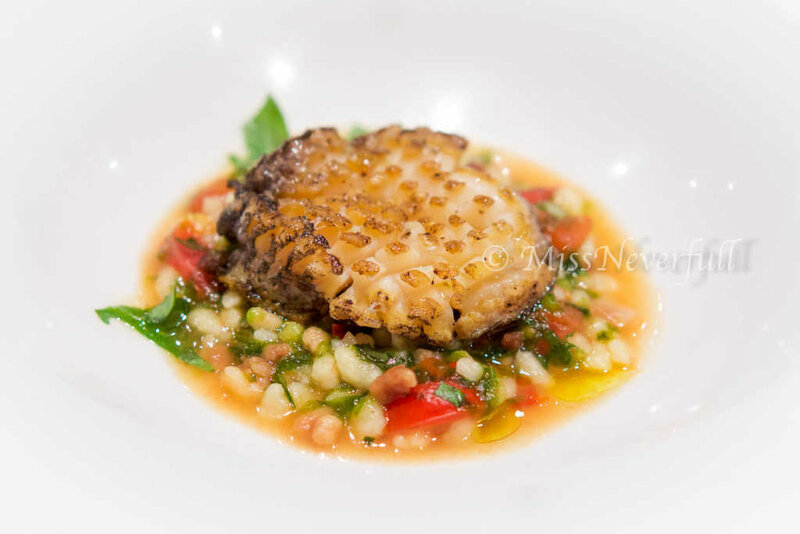 It was beautifully presented on a bed of hand rolled fregola pasta which was cooked al dante, the fresh cherry tomato and vegetables made a very delicious base. 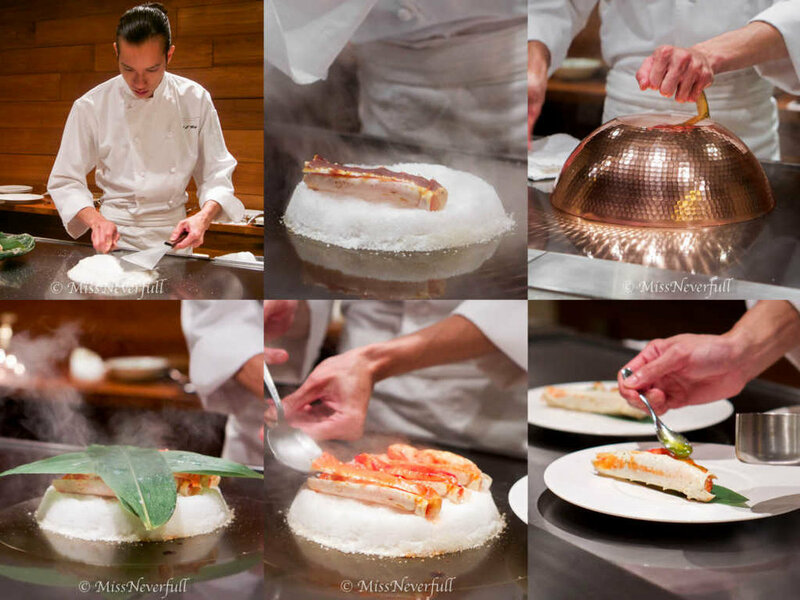 Finally the lobster was ready to serve, which is also a classical dish at Waku Ghin. The lobster was wonderfully braised, very succulent and umami, with a hint of sweetness from the lobster itself. While the gravy was even more impressive, so perfectly umami but not overwhelming. This dish was served a freshly baked bread roll, which has a lovely crust and soft inside. I seriously mopped up the soap with the bread. Next dish was Japanese Ohmi wagyu roll, its marbling looks so good. No heavy seasonings are needed for cooking the wagyu, it only need a sprinkling of pepper and salt. The beef was lightly seared to medium, leave a perfectly succulent texture. I didn't had the beef so it's hard for me to judge, while the other guests at the table said it was melt-in-mouth tenderness and very delicious, the side of citrus soy nicely lifted the flavor with a refreshing twist. For me, i had the slow-cooked Amadai (tile fish) with black truffle instead of the wagyu roll. Although i am pretty full at thr point, the fragrance of black truffle made me hungry again. The amadai was very tender and umami, the soy broth has a sweet infuse and paired well with simple and clean flavor from the fish. The generous portion of shaved black truffle nicely enhanced the flavor of the entire dish. One more step towards the dessert, another enjoyable dish - truffle rice. The rice was cooked al dante with very umami stock, its creamy texture was more on the risotto side. The gorgeous amount of black truffle again made me so happy, but there were actually more treautre underneath - caviar. With a pint of baby scallions, the blessed bowl brought a nice ending to the main dishes. Before heading to the main dining room for desserts, we were served with the freshly brewed tea by Chef Cory to cleanse our palate. The tea is from Japan and it is specially made for Waku Ghin. Gyukuro tea is covered from the sun during the last two weeks of fermentation. Unlike other teas, its young leaves are dry in sunlight instead of oven-baked, which gives it a very unique seaweed flavor. The tea leaves were brewed at the right temperature between 50-60 degrees, hence no bitterness at all. 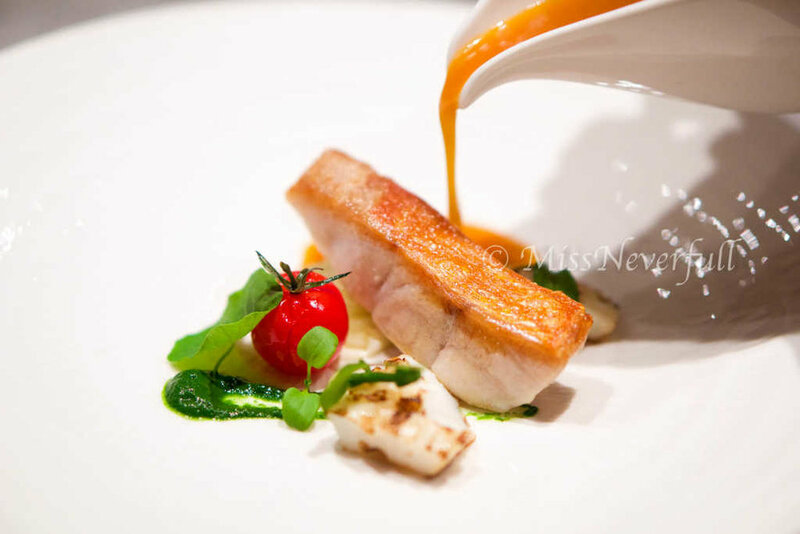 The main dining room faces Marina Bay, with a amazing view of Singapore's skyline. 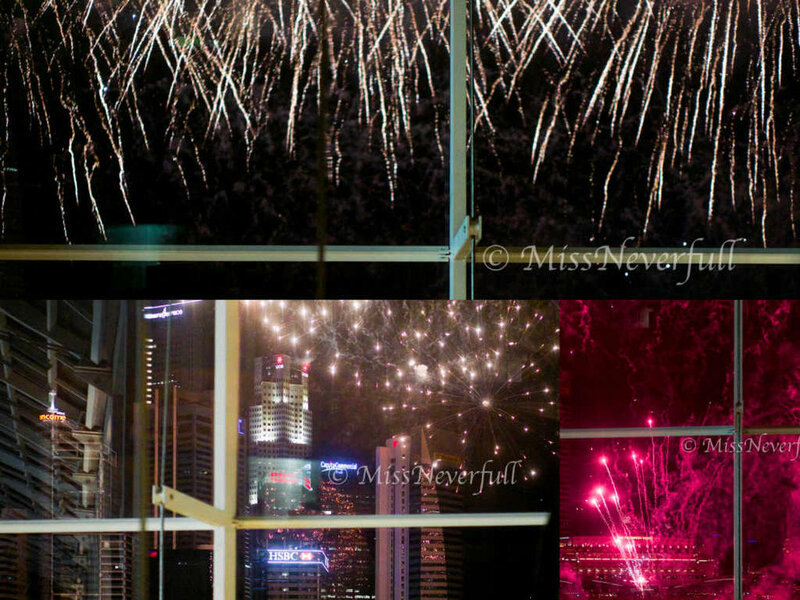 I booked the first-round dinner thus it was around 8pm when i left the private room, luckily the firework show at Marina Bay Sands just started. I was served some recommended wine to pair with the desserts - its unique plum flavor and slight creamy texture paired with sweets very well. 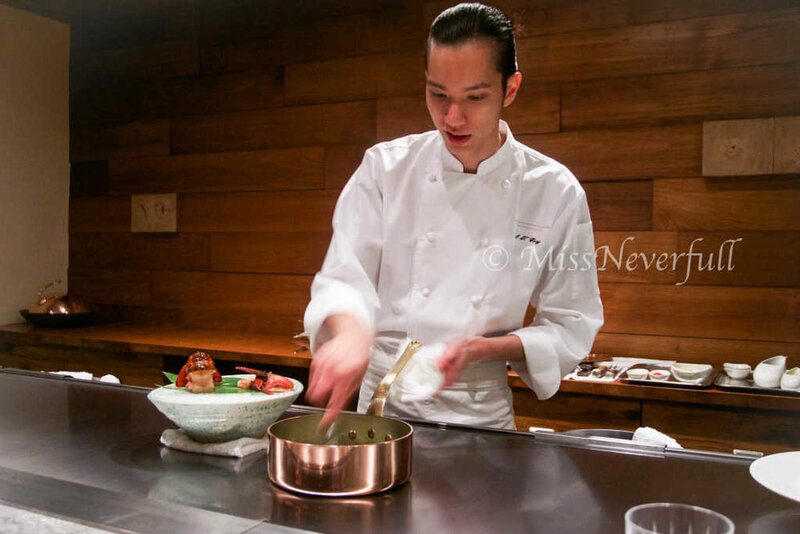 The first dessert was specially made from the chef (as the other tables were having a slice of Japanese melon). The Japanese premium peach was 100% mature, so soft and juicy, its endless sweetness balanced very well with the champagne granita and fresh raspberry. I was so stuffed and i cannot imagine this is only the first dessert of three. Matcha and red bean is no doubt the best combination. Unlike most red bean dessert with oversweetened and smooth paste, the red bean pie was very 'real' and naturally sweet, with a flaky pastry outer layers, the warm-served red bean pie was very special and balanced very well with the sided Maccha and Tonka. The last dessert is the delectable chocolate mousse, which is also Tetsuya's Chocolate Cake. I had it when i was in Tetsuya's in Sydney this April, missed it so much and i was so happy to have it in Singapore again. The chocolate mousse was heavenly - a very deep chcololate flavor, rich and smooth. The airy vanilla mousse in the center works very well with different layers of chocolates, the macadamia chocolate biscuit base was crispy and delicious. The meal ended with Petit Fours and your choice of coffee or tea. Petit Fours features assorted chocolate, ricotta choux, meringue with nuts and macarons. Chef Cory showed us the kitchen after the meal - it is much larger than i imagined. The team was very friendly and works in a harmony. Thanks Chef Cory and the entire team for the beautiful dinner. There is also a bar at Waki Ghin, opens daily from 5:30 till late and no reservation needed. The Bar at Waku Ghin features the art of Japanese-style cocktail making at its best. 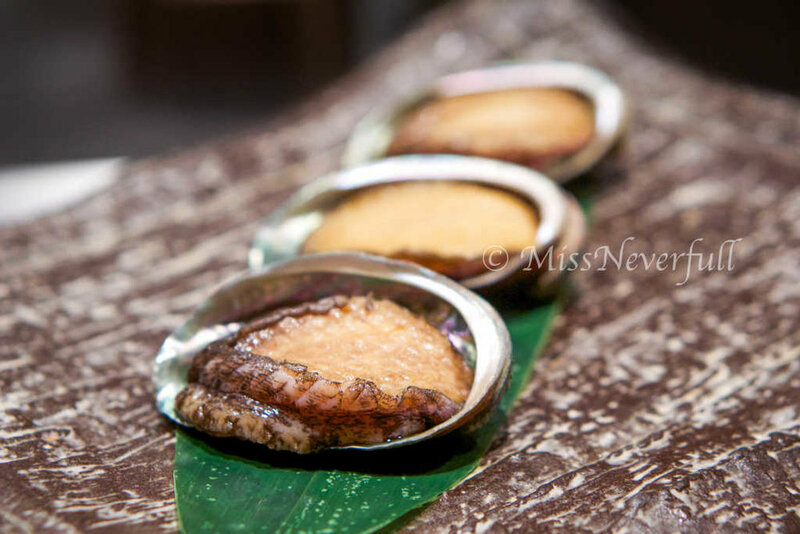 Bar nibbles are also available from S$35++. Offerings featuring caviar, oysters, cheese or meat platters are seasonal and based on the freshest produce available.